Lettering With Purpose is a brand new release from professional lettering artist and instructor Brittany Luiz, designed to teach readers how to get started with lettering and encourage them to create their own beautiful artwork. The book takes you through all of the basics from tools and materials to compositions, different styles and even how to digitize your work using Photoshop. Once you have the basics mastered the book also shows you how to build upon these skills with tips on how to develop your own personal lettering styles using flourishes, frames and other extras. As well as basics and advice there are several full alphabet examples included which showcase different styles of lettering to help you practise and encourage you to develop your own personal style. When you feel ready to put your new lettering skills to the test the book has some great art print project ideas using various techniques and materials such as watercolour paints and chalkboard pens. At the back of the book is the author’s favourite section, a set of 100 creative prompts complete with space to practise each one, plus a list of tips to help you find inspiration for your designs going forward. 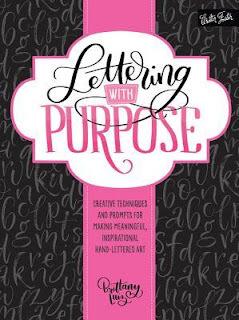 Overall I think Lettering With Purpose is a great book for beginners, covering all of the basics needed to get you started with this art form and providing inspiration to encourage readers to create their own unique lettering styles and designs. I have my new brush pens at the ready and am looking forward to trying out all of the tips and tricks included in the book!